Need help deleting an old repository that you no longer need? 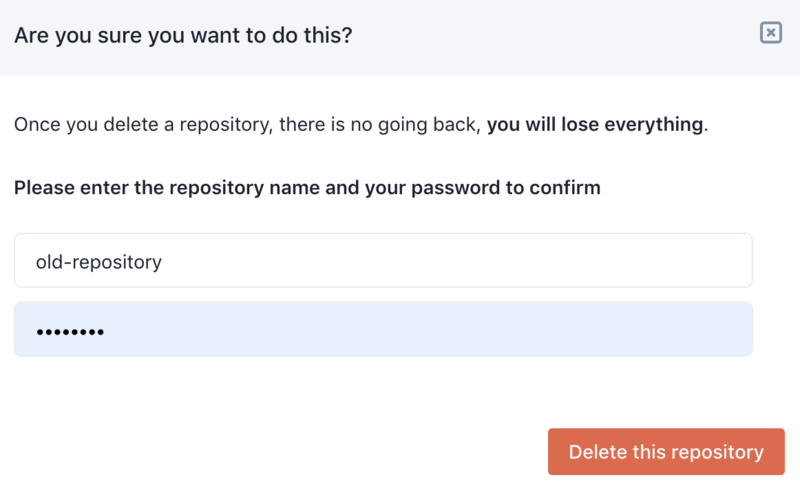 This guide will show you how to delete your repository. Has time come for some spring cleaning? Got too many unused repositories? Well you're in the right place. This quick guide will show you how to permanently delete a repository. WARNING!!! Before going through with this process, be aware that once you delete a repository there's no way to get it back, the process is permanent. So please be sure you are ready to delete your repo and have retrieved any content that you might need. NOTE: Only the Repository Owner will be able to delete the repository. If you aren't the repository owner, then you will need to have the repository owner take care of this or transfer ownership over to you. OK, on with the process. 1. Navigate your browser to the Prismic repository that you would like to delete. 2. From here your should click the 'Gear' icon on the bottom left of your screen, to navigate to the settings section of your dashboard. 3. Next you will want to go the 'Danger zone' section of your settings, the last option in your list of options under the miscellaneous section. 4. In the 'Danger zone' you should click the large red button labeled 'Delete the repository'. 5. Finally you will then be presented with a pop up box where you must enter your repository name and your Prismic password to confirm. This is the point of no return, once you confirm and click the 'Delete this repository' button everything in your repository will be deleted.